The following calendar was produced to act as a general fact sheet and month by month guide for the keeping and growing of Satsuki Azalea, primarily as bonsai but also as patio /potted plants. For a more thorough and definitive guide to Satsuki we would recommend reading “Floral Treasures of Japan” by Alexander Kennedy. Please remember that although these plants can be brought indoors for short periods at flowering time they are outdoor varieties Satsuki Azaleas have been bred and selected for over 300 years in Japan and are highly prized for their prolific and often varied flower colours. Although single coloured varieties of Satsuki are available the multi-coloured’s are often the most interesting and therefore, most popular. With their small, glossy green leaves, their quick growth and ability to withstand pruning/shaping these plants are ideal candidates for bonsai styling. 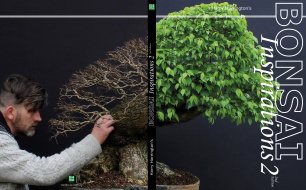 For 11 months a year, they can be seen as perfectly formed bonsai but then for that one special month a year they erupt in a profusion of colour that makes this species stand out from all other bonsai. There is a multitude of flower types and colours available on the thousands of Satsuki varieties available, the main four being: Selfs-single colour, Fukurin-coloured centres with white edges, Sokojiro-white centre with coloured edges and Shibori-which covers all the stripped, half & half, flecked and combinations of all these. Of the varieties available in the UK Kaho and Gyoten are probably the most common. Kaho will be recognizable by its mainly white flowers but also with pink, self’s & pink/white stripes. Gyoten (a sport of Kaho) has mainly pink flowers with frilly edges. The word Satsuki consists of two Japanese kanji characters; “Sa”, which is an old term for five, and “Tsuki”, which is the word for moon. Satsuki therefore means fifth moon, in other words the fifth moon of the oriental lunar calendar. This is equivalent to around June in our calendar and refers to the flowering period, as Satsuki flower around late May or early June. There has been a lot of discussion and debate regarding the origins of Satsuki azaleas but they are primarily derived from just two species, Rhododendron indicum, the “river satsuki”, and Rhododendron tamurae (syn. Eriocarpum), known as the “round leaved satsuki”. Some modern botanists have suggested that other species must have been involved because crossing wild plants of these two species does not give rise to all Satsuki characteristics. Other experts oppose this view, pointing out that plants found today in the wild do not reflect the original, very diverse plant population, because plant hunters or amateur gardeners have long since collected all unusual and interesting wild specimens. JANUARY & FEBRUARY These are quiet months for Satsuki Azaleas, being virtually dormant at this time of year. Older, larger trees can withstand a degree or two of frost, but younger plants must be protected. A cold greenhouse is ideal but if you do not have this facility try to position trees somewhere where they receive some protection from the worst of the wind and rain, maybe under the staging or at the base of a hedge. In either case be prepared to provide additional frost protection in the form of bubble wrap or insulating fleece during cold spells. Cold is not the main threat to Satsuki in winter -Water logging is, hence the need to keep trees under cover. In a greenhouse, leave the door and roof vents open on all but the coldest days to allow free air movement in the house. This will reduce the risk of mildew and other fungal diseases occurring and will also prevent temperature build up during any sunny days we might have. Trees will require water through the winter period but be careful not to over-water at this time. The ideal watering regime, as with all bonsai whatever the species, is to check each plants needs individually. Many factors determine a tree’s uptake of water. Satsuki, like other forms of Azalea are members of the Ericaceae family and as such are Lime haters. If you live in a hard water area use collected rain water if possible. Last seasons leaves will have fallen by now. If your trees are protected from wind these will accumulate on the soil surface and rot. Remove all fallen leaves, and the yellowing ones still attached to the tree. You may well be able to see the signs of growth appearing around the base of flower buds. These will produce this years shoots and on a healthy plant, there could be anything up to five around each bud. MARCH Plants over-wintered under cover will start showing signs of growth this month. New shoots will be seen emerging mainly from around the base of the flower buds but depending on the vigour of the tree shoots could be found anywhere on the trunk and branches! Trees can be brought out from cover on mild, sunny days but do not be tempted to leave out overnight as a frost could damage new shoots. There are two periods per growing season for re-potting Satsuki, one just after flowering in late May/early June or now in late March. If growing-on young, untrained material, now is ideal as it will allow a full season, unchecked growth. If it were rapid, growth you are after it would be beneficial to remove all, if any flower buds. Feeding should also begin this month on young and older trees alike. Specimen plants should be fed regularly from now until bud burst to help strengthen them prior to flowering. March is also a good time of year for refinement wiring of young growth in foliage pads. Heavy wiring to shape trunks and branches is best left until the autumn. ‘Kanuma’, a form of Japanese soil is often said to be the ideal potting medium for Satsuki Azaleas. The will however grow in any lime free compost mix.